In a recent blog, I talked about true freedom, which is the power to choose one’s attitude in any given set of circumstances. As teachers prepare to return to their classrooms tomorrow (at least in Arizona), I couldn’t help but think of the ebb and flow of a typical school year. To say that teaching is an emotional profession would be an understatement. Below is a poem I wrote, titled The Gift, which is designed to empower teachers in those moments when they may feel powerless. On Monday morning they will enter your room. Most filled with excitement, some overcome with doom. With their school supplies in tow, they will fill the empty spaces. Your room will quickly transform into a community of fresh new faces. The rules will be read, their folders carefully organized. Typical first day procedures will be flawless, just as you surmised. The first few weeks will likely be fueled by adrenaline and zest. The honeymoon period for the students will have them behaving their best. As the year progresses and the pressure to perform is heightened. The energy in the room may not be as enlightened. May very well be replaced with a look of anxiety or stress. As the amount of work on your desk begins to reach the ceiling. Each new mandate will consume your time. You’re proverbial teacher plate will be unable to hold the weight of a dime. I’m well aware that academic expectations are higher than they’ve ever been. It’s easy to get swept away by the data that constantly surrounds you. The list of students who are not meeting the standards may nightmarishly hound you. If you reach the point of burnout and experience feelings of overwhelm. I have a suggestion that will transform these emotions and put you back at the helm. You see, there is so much more than teaching to a test. In my opinion, it’s more about teaching your students to be their very best. Sure the grades and test scores are things we should address. But their character and values are more accurate tools for measuring success. So, let me introduce you to a skill that is often overlooked. It’s called emotional intelligence and it’s something you won’t find in your students textbooks. Unlike school-smarts, which relies heavily on one’s IQ. Emotional intelligence is your self-smarts, or what you know about you. You really do have the power to influence your emotions by learning to steer. The road conditions of life are out of your control. The steering wheel; however, should be your primary goal. Take the time to learn to manage your mind. When you do, it’s greater happiness that you will find. You are well aware of the power of teaching to learn. So, commit to teaching your students about self-smarts while their desire still burns. They are eager to learn more about themselves. It’s a gift you will give them; more powerful than any book on your shelves. At the end of the year when your students leave your room. It won’t be their test scores that your mind will consume. Your focus will not be on the amount of information you imparted. I believe in each of you and the remarkable difference you make for our youth. 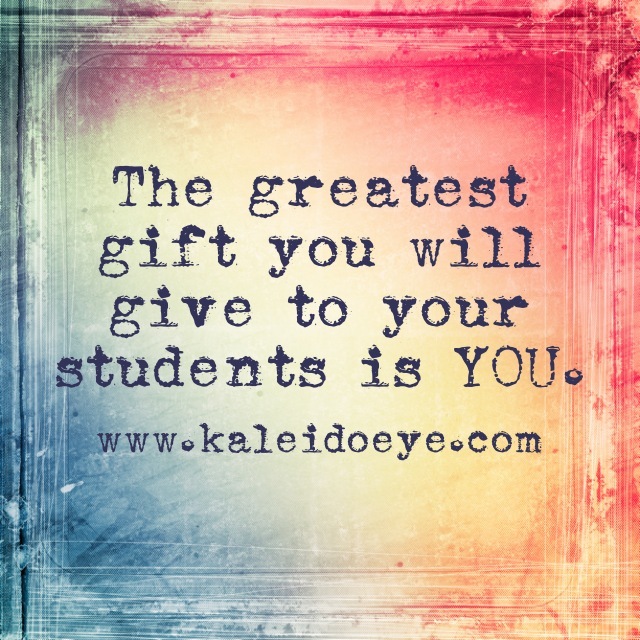 The greatest gift you give to your students is YOU, please remember this truth. I invite you to share this with every teacher you know.